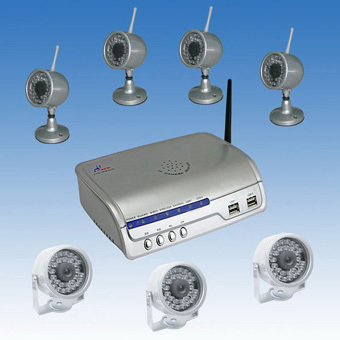 See More CCTV Systems Here Seven outdoor weather proof cameras ( four wireless and three wired ) with a 7 port IP camera server, simply place the cameras in the areas you wish to monitor and connect the camera server to your internet connection and you have a complete 7 camera CCTV system that can be securely viewed via the internet anywhere in the world. Maximum unblocked linear transmission distance for the wireless cameras is 100M, this will be reduced if signal is required to pass through walls and structures. All necessary power adapters and cables are provided, including 3x 10M a/v + power cables for the 3x wired cameras.